Here in the following a new assembling using data from ground-based observations recorded by the Subaru telescope at Mauna Kea (Hawaii) and space data from the HST. The Antennae Galaxies, also known as NGC 4038/NGC 4039, are a pair of interacting galaxies in the constellation Corvus. They are currently going through a starburst phase, in which the collision of clouds of gas and dust, with entangled magnetic fields, causes rapid star formation. They were discovered by William Herschel in 1785. NGC 4038 is located at RA 12h 01m 53.0s, Dec −18° 52′ 10″; and NGC 4039 at RA 12h 01m 53.6s, Dec −18° 53′ 11″. gas and dust ejected from the galaxies as a result of the collision resemble an insect's antennae. The nuclei of the two galaxies are joining to become one giant galaxy. Most galaxies probably undergo at least one significant collision in their lifetimes. This is likely the future of our Milky Way when it collides with the Andromeda Galaxy. Five supernovae have been discovered in NGC 4038: SN 1921A, SN 1974E, SN 2004GT, SN 2007sr and SN 2013dk. A recent study finds that these interacting galaxies are less remote from the Milky Way than previously thought—at 45 million light-years instead of 65 million light-years. 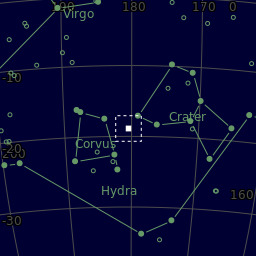 They are located 0.25° north of 31 Crateris and 3.25° southwest of Gamma Corvi. with the formation of the globulars likely originating from shockwaves, generated by the collision of the galaxies, compressing large, massive molecular clouds. The densest regions of the collapsing and compressing clouds are believed to be the birthplace of the clusters.